On January 11, the Africa Growth Initiative at Brookings released Foresight Africa: Top Priorities for the Continent in 2019. This annual publication delineates the year’s most pressing issues and offers guidance on resolving them. The report’s fourth chapter, “Fixing Fragility,” focuses on the role private sector and local institutions can play in addressing the challenges of fragile countries. As Figure 4.2 below reveals, natural disasters adversely impact fragile nations. In part, this is due to lack of infrastructure, limited emergency services, and many other factors that make a nation fragile and especially susceptible to disasters. In Africa’s case, this has led to billions of dollars in economic damage and millions of lives affected. The main components of economic damage include property, crops, and livestock loss. Millions of people’s lives are also affected. For many of Africa’s agriculture-dependent economies, these natural disasters can be immensely destructive. Spikes in damage from the El Asnam earthquake; flooding in Zimbabwe, Sudan, Madagascar, and Nigeria; and drought in Ethiopia and South Africa account for almost $15 billion in damage when added together. Between 1980 and 2018, drought claimed over half a million lives in Africa. 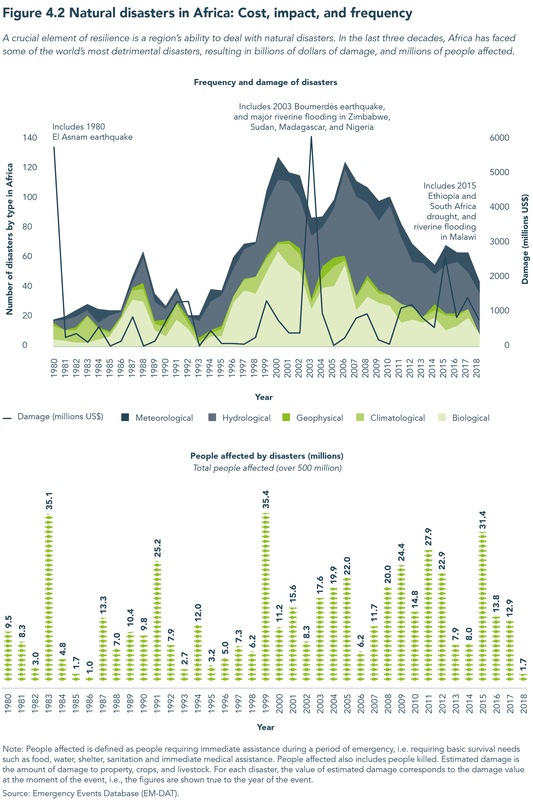 A close look at Figure 4.2 also reveals that the disasters that most frequently affect Africa fall under the biological and hydrological disaster categories. The biological disasters category primarily includes vector-borne diseases that may cause epidemics. In Africa, this mainly includes mosquitoes carrying malaria. The hydrological disasters category includes hazards formed by the occurrence, movement, and distribution of surface and subsurface water. In Africa, this category primarily includes droughts and flooding. The figure shows that the frequency of these two disaster categories dramatically increased between 1993 and 2007, and then began a steady decline to 2018. Understanding the unique threats disasters pose is one step of many in the ongoing pursuit to build resilience. Overall, Foresight 2019 stresses the importance and critical need for private and public stakeholders to not only acknowledge their respective responsibility in fixing fragility, but also to work together to achieve it.